Whether you're repairing your bar tap handles or making your own custom tap handles, you'll need this ferrule to connect them to your draft faucet. This decorative gold ferrule will upgrade any tap handle display. Ferrules are the pieces that connect your tap handle to the the draft faucet. You may need some of these beer tap handle parts on hand if you're replacing a damaged tap handle insert or if you want to make your own custom tap handles. This decorative golden ferrule will add an extra level of shiny flair to your tap handle display. Your generic, novelty, or custom tap handle will truly pop when you add this golden, curved tap handle ferrule! The ferrule worked out great. I love my Beer Tap Handle display. The ferrule is on the Lite Beer Tap Handle. I produce home made tape handles and ordered this item to place on a tape handle for the man cave. 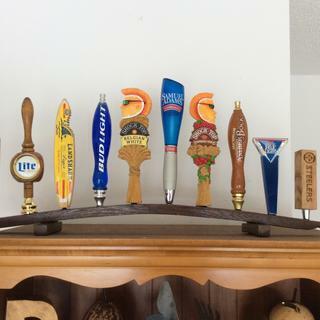 Similar to others I have on existing taps. Because I could not find online another gold/brass colored large ferrule. I need a description of the threads please?